The former Seal who goes by the name Mark Owen was on 60 minutes tonight. He said the raid on the Osama bin Laden compound was not a kill mission. He then describes how they were going up the stairs and had been told to expect one of bin Laden's sons to be there. They saw a figure disappear behind a door. They didn't know who it was. A Seal, on a hunch, whispers "Khalid." The figure peeks around the corner. The Seal shoots him dead. It was Khalid bin Laden. But this was not a kill mission. 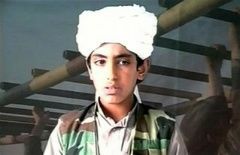 What Happened to Hamza bin Laden?